Republican presidential candidate former Massachusetts Gov. 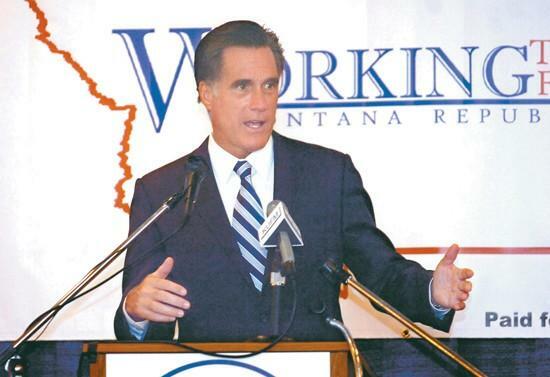 Mitt Romney speaks Friday at the Montana GOP convention in Helena. HELENA - Exuding optimism and barely mentioning President Bush, Republican presidential candidate Mitt Romney vowed Friday that he would continue to wage the war on terrorism if he's elected president next year. Romney, a former Massachusetts governor, addressed the Montana Republican Party at a breakfast meeting and drew rousing applause from the sellout crowd of more than 340 people. His stump speech was short on specifics and long on optimism and values, although he addressed a number of issues at a later press conference. "It's a time to be optimistic and not a time to look down on our shoes," Romney said. Citing new U.S. trade opportunities in China and India, Romney said there are now 1 billion new consumers for U.S. medical and pharmaceutical products and computer hardware and software. "Our Democratic friends, our liberal friends, are tempted to say our source of strength is our government," Romney said. "The source of America's strength is its people." America's strength, he said, lies in hardworking people who value education, are willing to save for the future, "who largely believe in God or something greater than ourselves" and are willing to take a risk. Romney quoted President Ronald Reagan by saying, "Conservatism is a philosophy of strength - strong military, strong economy and strong families and values." The candidate referred to his 25 years in the private sector, including running a venture capital firm, and his experience running the 2002 Winter Olympics in Salt Lake City. He quoted his father, former Michigan Gov. George Romney, who once headed American Motors, telling him, "Mitt, don't ever forget, there's nothing as vulnerable as entrenched success." "It's important for us not to become complacent," Romney said. "Washington is broken. Washington's inability to deal with the challenges we face is breathtaking." Romney took a swipe at Democratic presidential candidate John Edwards, who said there is no war on terror. "There is a war being waged," Romney said. "If I am president or any Republican is president, I'll tell you what: There will be a war waged on terrorists." He called for keeping federal taxes down and, in his lone reference to President Bush, said he favors extending the Bush tax cuts. Romney called for eliminating the federal estate tax, or "death tax" as he called it, and eliminating federal taxes on interest, dividends and capital gains. Romney also put in a strong pitch for family values, calling for efforts to reduce the number of children born out of wedlock. "I think it's critical we encourage again marriage before babies," Romney said. Many of those attending the convention were pleased with his speech. "Wow, that was a knockout," said Sen. Greg Barkus, R-Kalispell. "Unbelievable." Thelma Baker, a longtime Republican activist from Missoula, praised the speech but said she hasn't settled on a candidate to support. Baker said she may go to the national Pachyderm convention in Wichita, Kan., to hear the GOP candidates debate. Rep. Llew Jones, R-Conrad, said he liked the "overall optimism" and Romney's focus "on the American people." "It was good," said Sen. Jim Peterson, R-Buffalo. "I was impressed. He's the best I've seen so far." Rep. Elsie Arntzen, R-Billings, a teacher and potential candidate for superintendent of public instruction, said she asked Romney afterward where he stood on education issues. Romney told her he wants to continue the testing under the No Child Left Behind law. "He was impressive," she said. "It was an emotional speech."